Those of Bologna premiered in Sepang an evolution of their fairing, which incorporated three stepped wings on each side of the bike. It was time to say goodbye to the first preseason tests and in Ducati they left the best for the final. And not only in terms of results. The doors of the garages were opened and s of Borgo Panigale surprised with a design that gave a completely different air that the Desmosedici had shown during the previous two days. 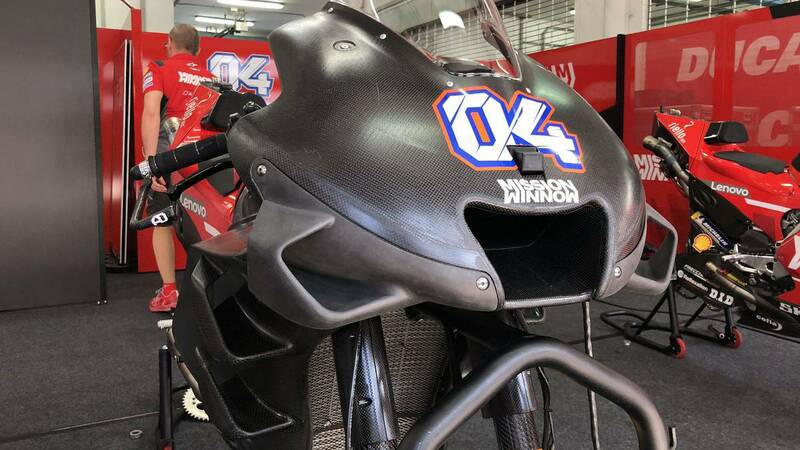 It was expected for Qatar, but they have advanced the deadlines and the new fairing shone in the Malaysian layout raising the first letters that they hide from Bologna to fight for the title in this 2019. Italians are still betting on an innovation that, for this course, places three fins stepped and anchored on each side of the bike. Break with everything presented so far but not with a regulation, which prohibits ailerons. Hence, the appendices are fixed. Predictably, this version of the GP19 will be what Ducati looks like when the World Championship starts and as in 2018, this season will only allow an update of the fairing that is homologated in Qatar. A limitation that did not sit very well in Bologna, but with which one must deal. Since the aerodynamics began to have weight within the World Cup, the Bolognese structure became a reference and now, has surprised with a revolutionary fairing with which they will try to improve the aerodynamic flow and load force, especially on the front axle, so that the frame is more precise when it comes to drawing. It is one of the pending tasks for the Italian motorcycle. Andrea Dovizioso has ensured that they still have "to win in the step by curve" and this variant is one of the solutions proposed for it. The Italian was the first to release the new formula. The sensations about the Desmosedici were positive but 'Dovi' prefers to be cautious, and wait to see how is their performance in Qatar. Little Danilo Petrucci could contribute. The Italian leaves Sepang with the best time but few sensations next to a fairing, which lasted only two corners. Once again, Ducati returned to be a pioneer and in a marked year in red to win again, has once again opted for aerodynamic solutions with which they seek to make the GP19 the most competitive bike on the grid.